If you picked up hand lettering in 2017 and have stuck with your new awesome hobby until now—yay! you made it so far! Getting started is the hardest part but if you're not constantly pushing yourself, you'll soon find all your brush calligraphy pieces looking just “good enough”. To that end, I always keep a handy supply of lettering inspiration in an Instagram Saved collection—things that I consciously want to try more of. 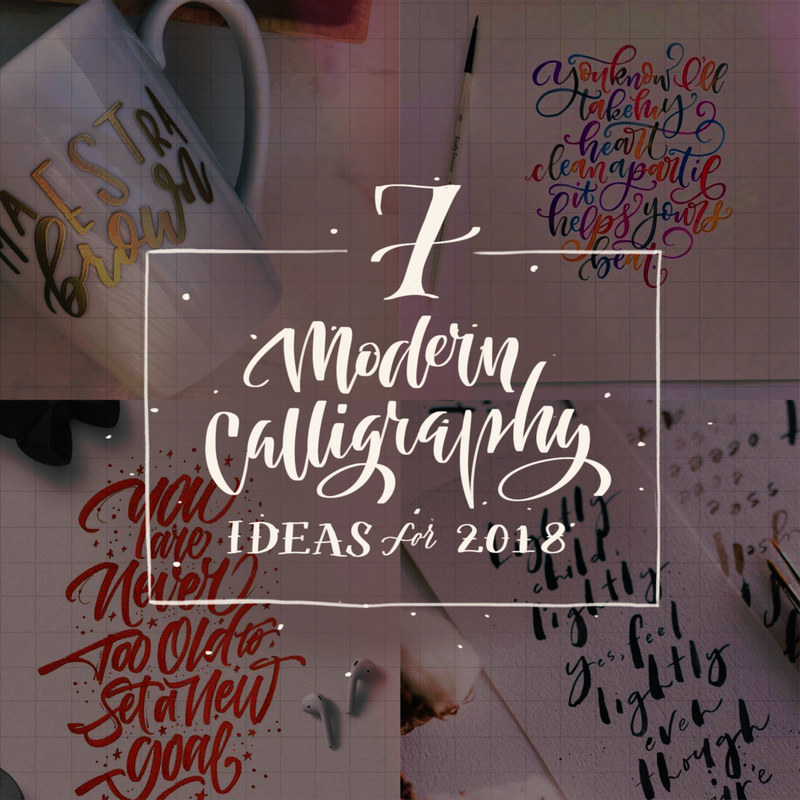 Here are my best picks for modern calligraphy ideas. Some have an interesting style to be tried, some are part of recent lettering trends, each can help you bring a new aspect to your lettering. When you start learning calligraphy, most instructions (including me at my workshops) tell you to keep your strokes the same thickness and thinness—maintain equal contrast. But once you've learned the rules, have fun breaking them. Ornamental nibs have big flat round tip that gives you thick strokes of perfectly uniform thickness. Because you can use them with inks, you can try all sorts of colours and blending. These will also give you uniformly thick lines in calligraphy, which will result in different styles than brush tips. A different tool can sometimes force you to try out different lettering styles. You can use markers from Posca or Brustro or Zig. The world can be your lettering canvas! You can do calligraphy on leaves, mirrors, shells, jars, coffee mugs and walls. While it depends on the surface you choose, you will likely need permanent markers to do this. And if you want your artwork to last longer, get some Mod Podge. This lettering technique has caught on recently and I'm hoping to give it a try in 2018. It looks so damn stunning. You'll need an embossing pen and embossing powder. Colour is one of the easiest ways to experiment in lettering. For multi-coloured pieces, you can use Camlin (cheap) or Ecoline (expensive) drawing inks or watercolours. I bought an iPad Pro and Apple Pencil over a year ago and have spent countless hours practicing calligraphy, playing around and even creating final client work on the Procreate app. So much so that now I've created packs of custom calligraphy brushes (for the Procreate app) that simulate real-life calligraphy tools. If you want to try a cheaper option (iPad aren't famous for being affordable), get a basic graphic tablet by Wacom or iBall. Now if only real life had a streamlining feature too. 🙌🏽 Made in Procreate app on iPad.